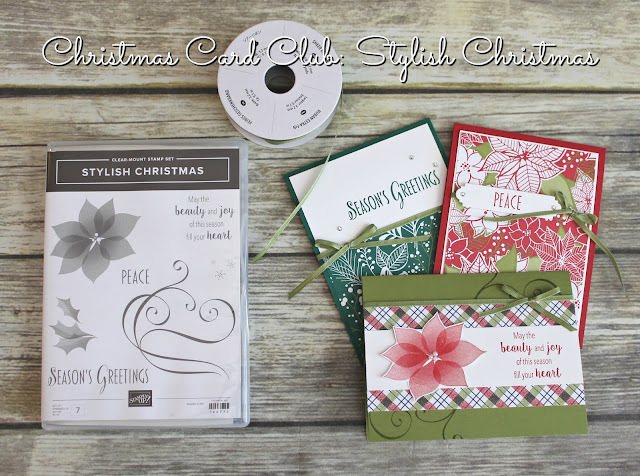 It's time for my favorite classes all year - my Christmas Card Club! These cards are meant to be fairly simple so that you can make more of them and get your Christmas cards ready to send in December. This year, I'll be offering a different class each month for four months. The more you participate, the bigger benefit for you! Not only will you get more Christmas cards done, but I'm also offering bonus coupons for you if you purchase at least two months. Purchase 2 months, and receive a $5 coupon off of a $30 purchase. Purchase 3 months, and receive a $10 coupon off of a $40 purchase. Purchase all 4 months, and receive a $15 coupon off of a $50 purchase. These coupons can be redeemed with me during the month of December. Are you ready to see this month's class? If you are interested in purchasing this class, please email me and I will send you a link to buy. The deadline to purchase is August 15, and kits will be mailed no later than August 29.